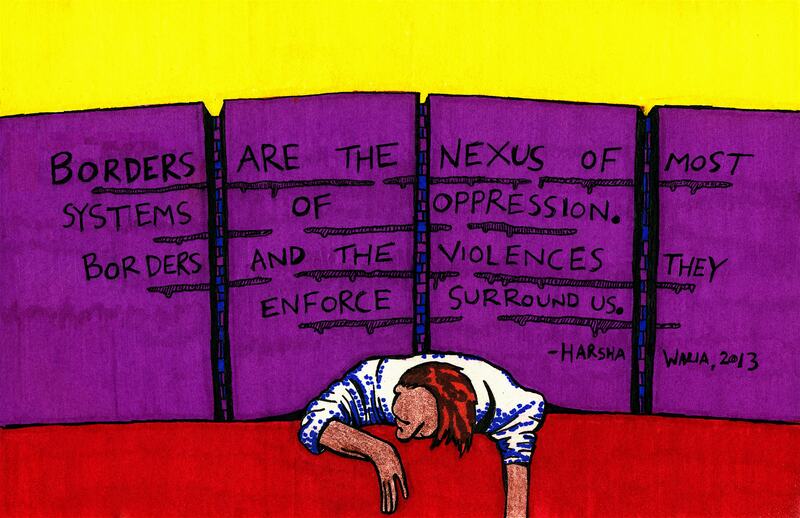 Image caption: a purple border wall with writing on it: “Borders are the nexus of most systems of oppression. Borders and the violences they enforce surround us. – Harsha Waria, 2013.” A person is being crushed underneath the wall. By Lauren Beard; Artwork by G.R. Borders were a common theme in the 2016 presidential election, with Donald Trump’s threat to build a wall between the United States and Mexico, as well as his promise of a travel ban. These borders are very important to Trump’s America First plan. Harsha Walia is a Canadian social justice activist and the author of Undoing Border Imperialism. In her book, she argues against the idea of borders. Instead, she argues for a borderless world. Walia says that four elements make up border imperialism: 1) unfair relationships between countries, 2) governments hinting that most migrants are criminals, 3) governments being racist about citizenship, and 4) governments and businesses abusing migrants and low-income workers. Israel’s occupation of Palestine shows how unfair international relationships can hurt people. Treaties like NAFTA have also worsened economic crises in countries like Mexico, pushing people out of the country. Governments and businesses can also profit from investments in private prisons by incarcerating migrants, who they treat as criminals. The third element of border imperialism includes racist ideas of who belongs and what makes a “good citizen.” Racist ideas of citizenship can be harmful. Examples of this include slavery, segregation, internment camps, and the war on drugs. Racism also carries a sexist component. This is often seen when the “civilizing” or “making better” of other women is disguised as feminist solidarity. Post-colonial Professor Gayatri Spivak gives the example of “white men saving brown women from brown men” as racist and sexist. The fourth element is the exploitation of migrants and low-income workers. It is easier for businesses to take advantage of people who do not have citizenship. These four structures of border imperialism show that the state reinforces and furthers the exploitation of migrants and low-income workers through racism, sexism, and abuse of immigrants and workers. Walia shows that borders only protect people who already have power. Therefore, she proposes decolonization as the alternative to this oppressive system. Removing borders would replace the racism, sexism and exploitation with communities built upon mutual aid, collective liberation and humility. She believes that a borderless world would help communities grow together. If you enjoyed this post, help us grow by contributing to the Philadelphia Partisan on Patreon.